← Oh What A Time! The northern half of the Presidentials were peeking out over the shoulder of the Moriah-Carter Range. From right to left you can see Madison, Adams, Jefferson, Clay and Washington. Coming off the heels of my San Francisco vacation last week, I immediately hit the training hard. It started with our early morning Yoga class on Wednesday and Thursday and a bike ride and run on Friday. Then, for the finale: we challenged Mt. Moriah on Saturday. Mt. Moriah, which is just outside of Gorham, NH has a few different ways to reach the mountain. We ended up taking one of the approaches from the west up the Stony Brook Trail. With a goal of 5 hours and 30 minutes we had 10 miles and 3300′ of gain in front of us. This trip was myself, Ben, Trina and Jessi who was joining us for her first training hike experience. We thought that Mt. Moriah would be a good challenge, but obtainable. It sits on the Northern end of the Carter-Moriah range and is not as heavily visited as it’s more popular, aggressive Presidential Range to the west and south. 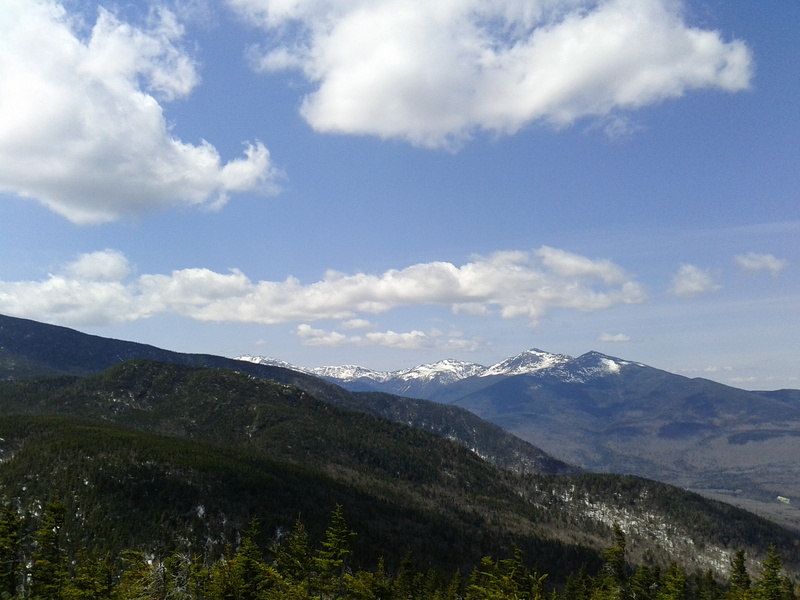 It provides incredible views into New Hampshire and Maine and has some nice alpine areas to travel through. We hit the trail fast with Trina leading us up the lower section of the trail at a brisk pace. The lower section of the trail is fairly wide and easy to follow and moves at a decent grade. There was no snow to be found and had one water crossing which was fairly simple. The trail paralleled the Carter-Moriah Trail to the north separated by a deep divide of the flowing Stony Brook. At around 2000 feet or so the snow started to appear. Seems silly looking back at it now, but I never even thought snow to be a factor. But the remaining snow pack was still there waiting to melt. It was also sitting there waiting to swallow our steps as we traveled across it. We had to walk carefully and slowly because of the risk for the occasional post-hole step. Post-holing is not only aggravating because it slows you down, but you could easily twist an ankle, tweak a knee, pop your hip, etc. as you fall through the snow. Despite the slow down we made it to the intersection with the Carter-Moriah Trail in the col between Imp and Moriah in a little over 2 hours. We chatted with another hiker as he passed on by and then made our way towards the summit. With another 1.4 to go to the summit we knew we had to boogie. And this is where we slowed right down. The snow pack was challenging to navigate and it felt like the trail would never end. We finally found the summit area and pulled up some rock to stretch it out and grab some lunch. While off the pace at this point a break was needed. With perfect weather and a grande view of the northern half of the Presidentials, we were more than happy to take the time. After an hour of hanging out and fueling up we started the slow, precarious trip down. Cautiously taking each step and slide down the slippery snow we moved as quick as we could. Once we hit the snow line, however we were off to the races and made quick work of finishing the trail. We had a slight detour when Jessi and Trina missed a turn off to the stream crossing but once they turned themselves around we hustled the rest of the way. We didn’t beat the time we had set for ourselves, but our hiking time was right on pace for the book time. I think had there not been snow pack slowing us down, we would have easily made our time. Little did I know that as frustrating as the snow was for Mt. Moriah it would be 10x that for our next hike – the Royces in Evans Notch. This entry was posted in Hikes, Training and tagged Hike New Hampshire, Hiking, Moriah-Carter Range, Mt. Moriah, Presidentials, Training, White Mountains. Bookmark the permalink.